One thing I have been very bad at over the past few years is reading. I use to read plenty of books when I was younger, I would lap them up, browsing shelves at my grandparents or holiday locations and sample books I would possibly not read otherwise. It was a great way to learn something new and also challenge myself to read subjects I would probably never consider otherwise. So I have made a conscious effort to start reading again now I have the freedom. I have a stack of book titles to go through and am looking at randomly picking books off my kindle listing. I read a few books while on holiday and now spend at least an hour reading each day. It is great to sit down and read a book while enjoying the sunshine. I have also been reading blog posts too, which has been really good for me as it has helped me to realise I am not alone with my views on life. I have just been reading F2P’s guest post over on TFS’s site. Her views and comments ring so true with me. I enjoy reading her posts and really need to read more of them. I too remember reading ‘Status Anxiety’ and it was such an eye-opener at the time (I also read ‘No Logo’ by Naomi Klein). I remember going into work and analyzing the profiles of each of my work colleagues and which anxieties they suffered from. My old workplaces were stacked to the rafters with status driven people suffering from a myriad of anxieties. Plenty were following the herd instinct and buying things because others who they admired did. Others were keeping-up-with-the-Jones types who were always trying to outdo their colleagues and friends with bigger/better houses, cars, holidays, etc…. Rely on external cues to validate our personal worth. Believe our present self is never quite good enough. I worked hard to gain social status through my job. My family background isn’t good and I was the only child to do a degree. I worked hard to get there and achieve to prove that I wasn’t a misfit and useless. I was bullied at school and always told that although clever, I would come to nothing. A quote I think I have said before, my school career adviser said I just needed a job to occupy me until I married and had children! I saw my job as my proof of ‘self’ and that without a job I was nothing, I had a target and my personal critic was always saying ‘I am not good enough – must do better’ (which is why I am having a few anxiety problems now I am not working). It has been my external symbol of self worth for so long as I am not very trusting/shy and so probably don’t present myself well when meeting people and feel that my job is some kind of badge of honour to enable me to be accepted by others. My ex-partner’s family were very status driven and after I while I started to see the sibling competition and ‘Jones’ attitudes as something I didn’t like. Perhaps one of the reasons why the relationship eventually broke down. I was at Step#3 in F2P’s article, I was climbing the ladder and doing all those expected things – but felt empty. Now I am on my own, I started to pursue FI with the view that I would like to be happy through having the time to grow friendships and family connections, both have suffered due to my work life taking priority. I don’t want to be a lonely workaholic. It’s been a strange and very quick month since I walked away from my job and into a period of freedom. I received my last pay 3 weeks ago and I have a bit more than I expected. I have already seen a drop in travel expenses, no commuting. I have also been able to enjoy the good weather and started walking and cycling everywhere locally to reduce my use of the car. I have just returned from a really relaxing holiday in Scotland (same area that Ermine visited recently – I recognize locations from the pictures he posted). We had rented a cottage and spent the whole 2 weeks walking and cycling (hired bikes – so a bit of an expense!). 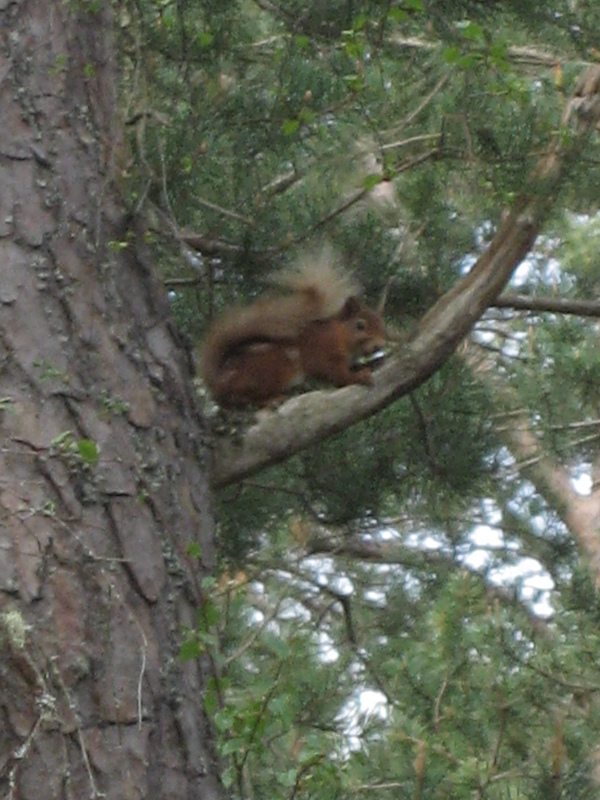 The wildlife count was spectacular : Osprey, Roe deer, Red squirrels, Mountain hares, Herons, Buzzards & Woodpeckers. The car sat quietly just being used to get us up there and back. My partner says that I was the most relaxed I have ever been while on holiday. I really needed the break and thinking back to this time last year, I was going through the turmoil of company sale and everyone wasn’t sure if we would have jobs – as it panned out, we didn’t. Now I have returned from my holiday, I am now having to occupy my day, at the moment this involves chores around the house and going for bike rides. I am trying to improve my health as I was getting headaches and possible panic attacks just before I gave up work. I will continue for a few more weeks before going and getting my blood pressure checked at the Docs. It has been high due to all the stresses I have been under in the past year and I want to see if the freedom and the increase in exercise has made a difference. I still check LinkedIn and a job is advertised that maybe of interest! LOL… I should be enjoying my freedom – but I get the pangs of being in a job – its the social conditioning we are all under. I have queried with the agent, waiting for a response. I am also getting queries from agents, they have probably heard on the grapevine that I maybe available. I should really be looking to have time away from the work environment. I have some unpaid volunteering work lined up for the end of July so I need to relax and concentrate on utilizing my time well between now and then. I am going through my paperwork, getting rid of old rubbish and also checking out all my expenses to see where my costs are dropping and where they may increase. I have my tax return info to get together too. Once this month is over, I can see what is left of my last pay and also can start to see what my true monthly expenses will be and where I will draw the income source from – cash or equities. I have some dividends due in August which will cover that month’s expenses.